May 28. 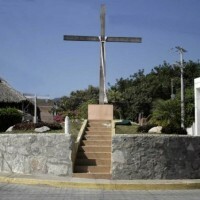 A man was murdered in broad daylight in Cruz de Huanacaxtle, a town in the municipality of Bahia de Banderas, north of the resort town of Puerto Vallarta. He was shot on Atún street between Tiburón y Sirena. The murder occurred the morning of Monday, May 28, near the the town’s health clinic. The first calls to police came at 11.25 a.m. The victim was hit in the head with bullets from an AK-47 rifle. Four 7.62 x 39 mm casings from an AK-47 were found at the scene. Terrified residents ran, ducked for cover, and threw themselves to the ground after hearing a number of gunfire bursts. Witnesses saw two white vans speeding away from the scene of the crime, leaving behind the body of a man identified so far only as “Chatillo” due to a tattoo on his chest. Another tattoo on his left shoulder said “santa muerte” (holy death). Directly after the shooting, some frightened residents ran to local schools to pick up their children - the murder occurred near the Emiliano Zapata elementary school. Other citizens temporarily shuttered their businesses. A few minutes after the gunfire was heard police patrols showed up, sirens wailing. The dead man was wearing a red shirt, blue jeans, and brown boots. He was estimated to be between 27 and 35 years of age. The deceased had no identification on him. However, a yellow envelope was found, as is commonly used by banks, suggesting he may have been robbed of some cash. Hey just wanted to say thanks for posting this. I'm sure a lot of the local businesses in La Cruz would rather not know that a guy got gunned down near a school. We lived there for five months and will be going back in the fall, including with our two children. Thanks for posting what's actually happening; I can get the sugar coated version of Mexico from plenty of sources.